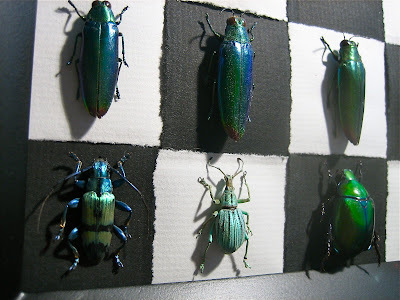 The Return of Bughouse Chess! Finally, the return of "Bughouse Chess"! The first edition of this series was very popular and sold almost right away. Several people inquired about my making another, and so, two years later, here is the second incarnation. 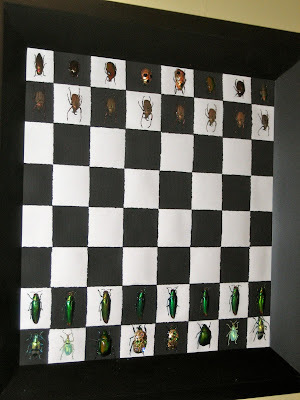 Each "Bughouse Chess" piece is one of a kind and unique. 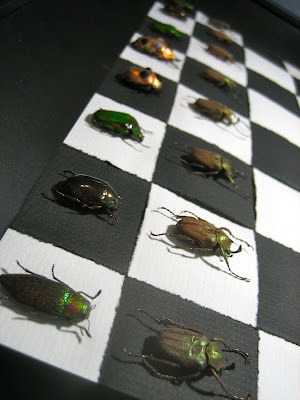 While each "chess board" is made in the same way, the bug "players" will be unique to each piece. This piece has a "green/gold" team and a "red/copper" team. 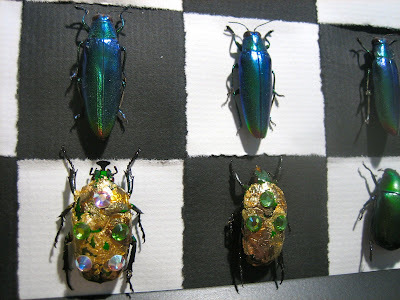 A complete list of beetle species will be included on the back of the frame for the winning buyer. 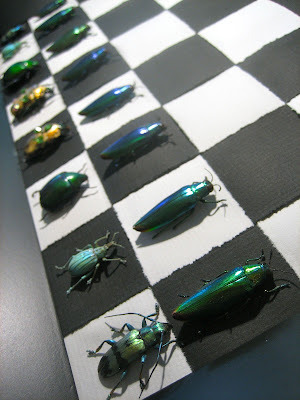 There are a total of 32 beetles in this piece. The King and Queen on each team have been carefully decorated with real gold or copper leaf and Swarovski crystals. The king and queen of the red team are decorated in copper leaf and black & white crystals, while the royals on the green team are decorated in gold leaf with black, white, and green crystals. Gold leafing real beetles is a time intensive process that requires a very steady hand! Each end product is totally unique. The chess board has been woven by me with strips of hand-torn black and white artist's paper. 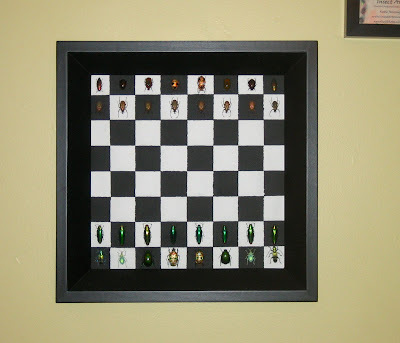 Chess board measures 12x12", and the entire framed piece measures 16x16x1". 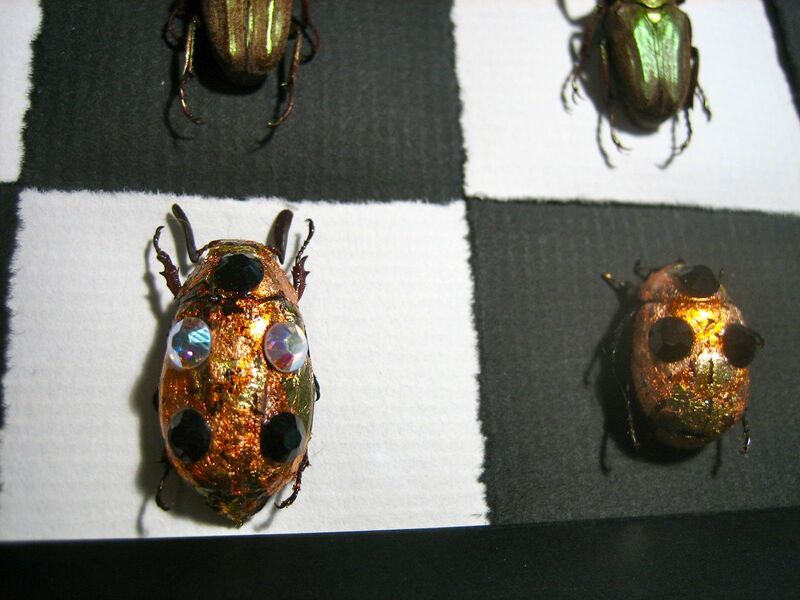 The average height for each beetle is about one inch. This piece comes framed, ready to hang on your wall. If you are interested in purchasing, please visit the listing in my etsy store.